A couple of things cropped up today. Microsoft were looking for user feedback – I’m happy to give this for the most part so that was done. Then there was *that* argument. I stopped reading Slashdot because of *that* argument and I think I’ve written about it before on previous sites. It relates to computer operating systems and the tribalism that goes with them. I run iOS on my mobile devices. I run Windows on my personal computer, Windows is applied to me at work and as far as business systems are concerned, I have a lot of experience with an IBM mainframe. That’s not to say they couldn’t do what mainframes did. But because they didn’t know exactly what mainframes did, and what was required of said mainframes, they weren’t, in my opinion, qualified to comment one way or the other. *That* debate was interesting because you could see a key difference between basically two generations (I’m comparatively young and most mainframe experts are generally older than me). The older guys, the guys who knew large systems, took the view that there were many systems and many tasks and no system was appropriate for all tasks. That there were some things that mainframes did better, and some things that more modern server farms did better, and likewise on the desktop front. You could not argue that only one OS was able to do everything. It could but that didn’t mean it was any good at it. Debates of this nature wear me out. Today it was desktop related. One key argument given in favour of anything other than Microsoft Windows is that it’s a) easier to configure and b) easier to use than Windows. In other words, Windows is the worst. Again, and again, and again, it’s really not that simple. Windows is actually very easy to plug in and play. It’s when you want to do something outside the box that it can be not straightforward. But that lack of straightforwardness is often accepted as normal for Linux installs. And the software you might want to use may not have a Linux version. Photoshop is a key example. It’s not that there aren’t functional equivalents, and in the Linux world, yes, there is the Gimp. But I’ve used it. And I have paid for Photoshop because it has been worth it to me. Probably the easiest plug and plays are Macs. But if you’re a technogeek who likes messing around with the innards of an OS, it may not be the best choice for you. In fact, given the way Apple are going with their mobile devices it almost certainly won’t be in the long term. Ultimately, the point I am making is that it is not true that Linux or Mac or Windows is the only answer to the question. Different OSs, different systems do different things better or worse. It’s almost like the laws of comparative advantage. So your main objective shouldn’t be to religiously devote yourself to one OS. I’m really not impressed if you say unto me that you do everything in Linux because in the grand scheme of things, that does not render you qualified to imply that everyone should do things your way or, indeed, that everyone needs to accomplish the same tasks as you. In other words, different tools fit different requirements and this is true even at the OS level. The game is changing, basically. ETA: This post was written before I heard that Steve Jobs had died. How communications changed your view of the world. Way back in a past life when I was a regular member of a library (when I had fewer plates to spin), I picked up a book called Krakatoa The Day the World Exploded. In addition to all the disaster details about the numbers killed, how they died and how Krakatoa differed to a lot of other volcanic eruptions in the area, one of the things which struck me was how the changes in communication technology at the time caused that to have greater in depth reporting in Europe than pretty much any previous similar – for a given value of similar given that the Krakatoa disaster was historically noteworthy – on account of the telegraph. You could see this earlier this year when Japan suffered its megaquake and tsunami – the news spread like wildfire around the world because it’s just so easy. About an hour ago, north western Canada was hit by a 6.7 (currently this is what the USGS is giving for it). It’s not a particularly highly populated area and the epicentre appears to have been some distance from the closest major population centres. I picked up the news on twitter which is where I get most of my news and from there went straight to the USGS. Another of my friends gets a push notification on his phone for any earthquake measuring greater than 5.0. I’m not a geologist. I’m just curious about a lot of things sometimes and one of the things that catch my interest a bit more than normal is how the earth behaves, in particular, when things go wrong. Hence, I borrow books about Krakatoa blowing apart. And I read articles and watch science specials. I know, for example, that there’s a supervolcano under Yellowstone National Park and that it blows at relatively regular intervals and is now running late. I found that fascinating. My flatmate was terrified. But I can’t change how that volcano behaves. I just want to know more about it. I’m also fascinated in how information from the past is painstakingly collected and collated to tell a story. The earthquake in British Columbia is part of a story I find fascinating and it relates to the Cascadia Subduction Zone. Put simply, every so often, there is a major, major earthquake there. Because that area isn’t so populated, the record of those earthquakes is drawn from the earth. It’s also drawn from Japan because experts in tsunami history have been able to match up a mystery tsunami with an unrecorded earthquake in North America, unremarked there because of the very low population density there. That element of detective work fascinates me. When the earthquake struck Canada this evening, it automatically flagged for me because I know about the Cascadia Subduction Zone and the fact that historically it has generated some serious activities and some significant tsunamis. It’s based on the fact that I’m an information magpie sometimes. My friend who gets the earthquake alerts on his phone wasn’t familiar with this. I can’t remember whether it came to me via some documentary on a cable channel (possibly) although i was reminded of it in a piece I read on the site of a west coast America newspaper the other day, the main thrust of which was to highlight just how unprepared that area is for a major earthquake. I’m not sure I’d know quite so much about these things if it weren’t for those sources of information like the library when I was younger and now, books on demand courtesy of amazon.com and the kindle software. Yes, I still occasionally watch these things on television because television has an interesting way of presenting information sometimes even if it can be a lot more superficial than the details you get in well written (and illustrated) books. And websites now. I love that I can go to this amazing vat of knowledge and get what I want. When I ring my mother to tell her about things like this, she reaches for the radio because when she was my age, radio news was internet. For me now I reach for the USGS page and find out all I need to know (like where this thing was on map relative to the CSZ so as to confirm my suspicions). Easy to use or not. I am a mainframe programmer and past discussions on slashdot.org (wonder if that still even really exists) have taught me that a) mainframe programmers understand different tools are appropriate for different purposes and b) Linux enthusiasts tend to have the fervour of the average recent religious convert (more zealous than the founders themselves and c) too many elements of the argument are subjective anyway. 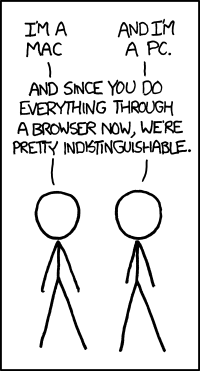 The argument/debate/online fistycuffs centred on which was easier to use, Linux or Windows. At this stage I have to declare the following interest: I use Windows machines both at work and at home when I’m not TE into a mainframe environment. It’s not that I have anything against open source – philosophically the idea fascinates me – but that various things for which I require a functional computer also require that I run Windows. I have never owned a Mac, although I’ve used them from time to time. So I can’t actually make a call on whether it’s easier to use Windows or Linux. However, pretty much everything I have read suggests that if you’re not a technically minded person, Linux is currently nowhere near out of the box enough. You could argue that Windows isn’t either, but typically, I don’t have to do much or anything to the box when I buy it, I don’t have to set up anything other than a wireless connection and then it, over a bit of time, sets itself up to a greater or lesser extent. There’s no messing around with drivers, there’s no messing around trying to get different pieces of software to run, you don’t usually have to actually install the operating system, regardless of how easy it may be to someone to install Linux to an empty box. The reason I got involved was that someone came up with the idea that computers were complicated machines and if they were complicated, then they shouldn’t be easy to use. I can’t understand this rationale in anything other than the terms of a guild protecting its own interest and mysteries. Lots of things are complicated, but they are easy to use. My example was cars – you no longer have to manually turn the engine, and things rarely go wrong with them (at least in my experience). Compared to how things were in the 1900s when people were practically building their own cars, cars are easy out to function. Likewise refrigerators. There’s a fridge-freezer just five metres away and I don’t have to do anything. I have no idea how it converts warm external air to colder air to keep my cheese from going mouldy and tomorrow’s breakfast at an optimum temperature for summer. Philosophically, I can’t understand the idea that because, underneath the hood of something is complicated, the end product has to be difficult to use. I have no doubt that if someone provides you with a Linux box that is all nicely installed and has email and a browser running okay on it, and maybe Open Office, the likelihood is that you’ll be grand, in the way that it’s more or less grand when you go and collect a Windows machine from your nearest retailer. But given that this option is difficult to come by for two reasons a) the OEMs would have to choose a distro and this choice would probably be castigated by some within the community and b) Windows machines are ubiquitous and they typically work out of the box for most people then for most people, getting a Linux box running is just not as obvious or straightforward as getting their Windows box up and running. A lot of technically minded people have no idea what it’s like not to be technically minded. They miss that people just want to be able to email their kids in America and their boyfriends in Sweden or whatever, they want to be able to read FaceBook and order books from Amazon. I can’t see how this needs to be complicated. In the grand scheme of debates over Linux versus Windows versus the Volcano, the idea that computers should be difficult to use is one I just can’t buy.